While I was away for a week, I saw that a bunch of you replied in comments to the "Who, What, Where" contest. Thank you so much for your thoughts. It gives me better insight into what some of my readers actually do in life. Now I will keep the contest and the comments section open for one more day. If you're a reader and you haven't checked it out, please do now. Comments close 12pm on Friday, July 17. Let's get that persistently annoying housefly at your place a new hobby. Let him ride a bike! The smallest bicycle in the world has no practical application for humans. 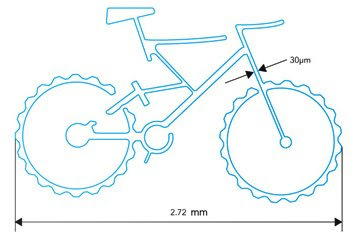 Researchers at Swiss-based GF AgieCharmilles played around with the capabilities of small wire electrical discharge machining (EDM) to produce a micro sized mountain bike. Check this out : The tiny cycle was machined out of 1-mm-thick Inox stainless steel (steel alloy with a minimum of 11% chromium by mass) using a 0.020-mm wire. The smallest internal radius measures a mere 0.013 mm it seems, with a tolerance of +/- 1 μm!! Check out the width of the headtube - 30 microns. Thats about the average diameter of a human hair. EDM is a thermal machining process that shapes electrically conductive, hard metals by using precisely controlled sparks that occur between an electrode and a workpiece, in the presence of a dielectric fluid (an insulator that becomes an electric conductor at a certain voltage). Here, the electrode is the cutting tool and it does not make contact with the workpiece, instead maintained at a distance called sparking gap. Hence, there is no tool stress. Sparking occurs in the frequency of anywhere between 2000 to 500,000 sparks per second. As each spark occurs, a small amount of electrode and metal is vaporized. This causes the sparking gap to widen and the next spark occurs at the point with the closest gap. What is interesting is that the vaporized metal and electrode forms a cloud in the dielectric. When the spark is turned off, this vaporized cloud hangs suspended in the same and solidifies to form an EDM chip. This chip is then removed by flowing dielectric through the sparking gap. According to Design News, one of the biggest obstacles to overcome in achieving these ultra-small features in the bicycle was in controlling the sparking gap. The Head of R&D Micro Machining Dr. Ivano Beltrami of the Swiss company said, "That means first being able to electronically measure a distance between electrode and work piece at the level of only a few (two to ten) micrometers and second being able to keep the gap width relatively constant." It's particularly difficult, he said, because of the particle contamination in the dielectric and the stochastic nature of the spark formation. Asked if the wheels on the bike actually spin, Beltrami replied "No, it's challenging enough to actually have the wheels at all." I agree with him. It'd take something of a miracle to make working bearings for those wheels. But you never know, considering the pace with which nanomanufacturing is coming up. For instance, check out how the National Center for Electron Microscopy (NCEM) custom-engineered seemingly frictionless bearings a few billionths of a meter in size. Here's the EDM process I described to you above in action! Enjoy.